At the plenary meeting held by the Commission in the context of determining the winner of the gubernatorial election of Bali in 2013. Delivered winner in Bali gubernatorial election. Bali governor election winner was obtained by Mangku Pastika, with as much as 50.02% of the vote. Margin as much as 996 votes with its competitors. Excellence promoted by a coalition partner Democratic Party and Golkar, as well as seven other party was very thin, because to within 996 votes. Definitely Pasti-Kerta gain as many votes as 1063734, while the candidates for governor carried Puspayoga from PDIP, obtain as many votes as 1,062,738. At the victory by Made Mangku Pastika, making him elected as governor of Bali. So he became governor of Bali for the second time. 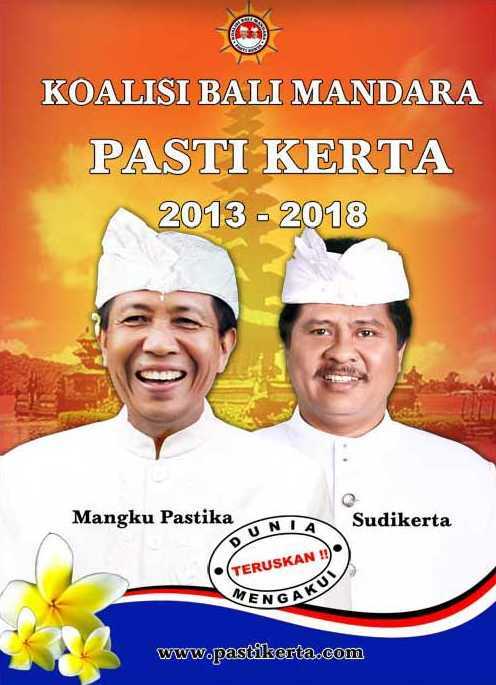 Mangku Pastika Being the governor of Bali for the second time until 2018. Plenary meeting of the heavily guarded security forces since the beginning of last tense. Before the plenary opened, dozens of cadres PDIP brings nine containers containing evidence of fraud. However, the police prevented them entering the area Bali Election Commission. After a small quarrel and fuss, then a number of witnesses from PDIP allowed entry.